MADRID, March 25 (Reuters) - Europe's biggest clothing retailer Inditex (ITX.MC) said on Wednesday March 25 it made a net profit of 1.253 billion euros ($1.71 billion), slightly higher than last year's figure and broadly in line with forecasts. Analysts had on average forecast a result of 1.232 billion euros according to a Reuters poll of nine. Sales rose 10.3 percent to 10.407 billion euros in the year to end-January, thanks to the aggressive expansion abroad of the owner of preppie label Massimo Dutti and youth fashion chain Pull and Bear. But earnings before interest, tax, depreciation and amortisation (EBITDA) came in at 2.187 billion euros, slightly below forecasts. The group said sales at constant exchange rates had risen 9 percent during February. Debt-free Inditex said it would take advantage of opportunities presented by the current environment and focus on the efficient use of capital. Many analysts had trimmed their full-year estimates in the past week, as macroeconomic data coming out of recession-bound Spain, accounting for around 35 percent of business, paints an increasingly gloomy picture. 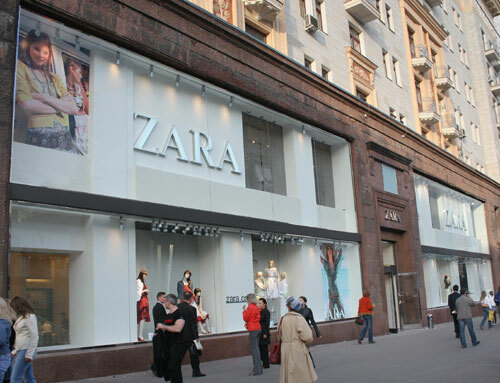 Inditex will give an analysts' presentation on the group's results at 0800 GMT.